20 / the tasting panel / march 2015 SOMM STORIES I t can be said that many professions converge for winemakers. They are often considered farmers, gourmands, artists and even chemists. The whims of the vineyard illuminate these many quali- ties. For those who have achieved Master Sommelier status, the emphasis on being multitalented might require a more deft touch than the ability to wear many hats: The melody of the wine professional, the wine itself and consumer must all be in tune. In Chicago, one Master Sommelier—Serafin Alvarado—has rediscovered his musical talents, and made a personal love of this art form blend harmoniously with a cover band he has helped create: The Rack & The Riddler. Alvarado, the first Puerto Rican in the world to be named a Master Sommelier and Director of Wine Education for Southern & Spirits of Illinois, assembled the band of life-long musicians who share a back- ground in wine. "Music was always part of my family growing up," says Alvarado. "I studied at the University of Puerto Rico with a music scholarship while majoring in chemistry. Wine emerged while working as a server in a hotel, and it combined an analytical, scientific approach with the more artistic and humanistic aspects of music." Thus, the harmonious chemistry of wine and music came full circle recently: Alvarado, who plays bass guitar, along with Jeff Elbel (vocals), Dave Jaramillo (rhythm guitar), Mike Barranco (lead guitar) and John Blum (drums) performed at Chicago's City Winery with a wine-and-music pairing theme that featured bubbly from wine and Champagne partner Moët Hennessy. The Rack & The Riddler performed five different sets of 1960s-era rock and other more current hits with a different sparkling wine or Champagne paired with each set. "The idea for this collaboration with wine and music has been percolating for months," says Rachel Driver Speckan, Wine Education Director/Beverage Director at Chicago's City Winery—a destination for wine, the arts and culture. "The pairing of music with wine is a simple concept, yet layered with thought and intention. It is an interweaving of the artist, the song, the winemaker and the wine." The Rack & The Riddler's opening set featured a welcoming theme, paired with Chandon Brut, followed by set one, with Chandon Etoile Rosé. Set two was then paired with Moët Imperial Champagne, set three with Moet 2006 and set four with Ruinart BdB. "We realized that this could become something more serious than just (having) jam sessions," says Alvarado. "It has opened a whole new door of contextual possibilities to enjoy wine, and I am happy to be a part of City Winery's (efforts) to take this perspec- tive to a whole new level of awareness and appreciation." 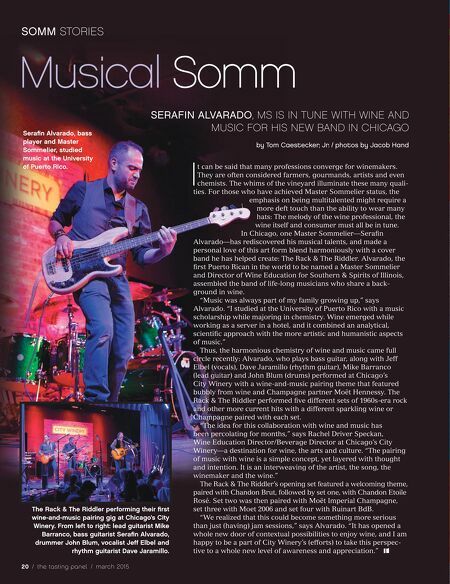 Musical Somm SERAFIN ALVARADO, MS IS IN TUNE WITH WINE AND MUSIC FOR HIS NEW BAND IN CHICAGO by Tom Caestecker, Jr. / photos by Jacob Hand The Rack & The Riddler performing their first wine-and-music pairing gig at Chicago's City Winery. From left to right: lead guitarist Mike Barranco, bass guitarist Serafin Alvarado, drummer John Blum, vocalist Jeff Elbel and rhythm guitarist Dave Jaramillo. Serafin Alvarado, bass player and Master Sommelier, studied music at the University of Puerto Rico.